Prt. Harold Raymond Winrow, formerly of the 1st Battalion of the East Lancashire Regiment and who served with the British Expeditionary Force in France, served with No.4 Commando from 1st March 1941 and took part in the OPERATION CLAYMORE assault on the Lofoten Islands (Norway). On 4th April 1941 he was transferred to No.6 Commando but was again attached back to No.4 Commando from 7th May 1941 until 4th June 1941. As a specialist in demolitions, Prt. Harold Winrow was attached to Nos. 2 and 3 Commandos as part of a detachment from No.6 Commando for the OPERATION ARCHERY raid on the Vaagso & Maaloy Islands (Norway) in December 1941 where he took part in the initial assault on the gun battery on Maaloy under Lt-Col. "Mad Jack" Churchill. Returning to No.6 Commando once more he embarked with the rest of the unit and half of No.12 Commando for the planned assault on Florø (N o rway) as part of OPERATION KITBAG. The operation being cancelled after navigational errors by their naval transportation as well as an accident onboard ship which resulted in the death of several of Harold's comrades, as well as the mai ming and injury of over a dozen more men. However, in January 1942 he set off with several officers and men aboard HMS Ingelfield for a secret return mission to Florø (N o rway) of which little is know n.
The young Private Winrow's skills in demolitions appear to have again been in demand as, after training on a number of practice runs in Southampton he was embarked in a small motor launch on detachment from No.6 Commando under Lt. John Alexander Bonvin for OPERATION CHARIOT, the large scale assault on the St. Nazaire docks in early March 1942. The detachment from No.6 Commando surviving the raid when their assault craft became lost in the dark and then upon its return to the allocated landing zone could not make landfall due to the area being blocked by the remnants of the other - now destroyed - landing craft. In late March 1942, Prt. Harold Winrow embarked with No.6 Commando and No.1 Commando for the planned OPERATION MYMIRDON assault on the French town of Bayonne. This raid was potentially planned to be one of the most daring large scale raids of the war, with No.1 Commando assaulting and holding the River Ardur Estuary whilst No.6 Commando would travel far up the river to attack an ammunitions factory. The No.6 Commando element of the plan was thought by many to be suicidal but in any case the tidal conditions did not allow for the initial assault to be launched and the operation in its entirety was cancelled shortly after the landing craft had been launched. In October 1942, Prt. 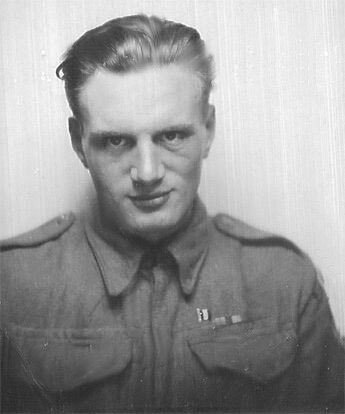 Harold Winrow embarked for North Africa (OPERATION TORCH) and along with the men of Nos. 1 and 6 Commandos would make the assault on Algeria disguised as American GIs. During his time in North Africa from November 1942 to April 1943 Prt. Winrow survived many harrowing ordeals including the strafing of the Troop Train en route to La Calle, the suicidal assault on Green Hill and the tremendous stand by the survivors from No.6 Commando against overwhelming forces of elite German paratroopers at Steamroller Farm. In May 1943 the survivors of the Commando returned to the UK and Prt. Harold Winrow spent many long months in hospital suffering from Toxic Jaundice before resuming his training for the planned assault on Fortress Europe as part of OPERATION OVERLORD. In early 1944, L/Cpl. 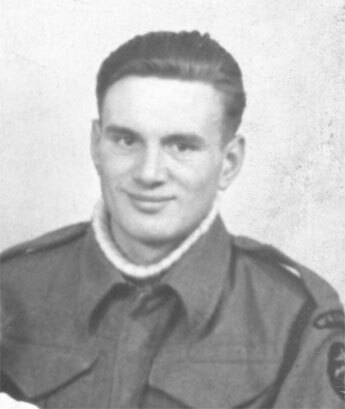 Harold Winrow volunteered to be trained as a paratrooper along with the rest of No.6 Troop of No.6 Commando but would make the assault on Queen Red Sword Beach from a small flat-bottomed LCI(S) that received a direct hit from German artillery as the Commandos were disembarking and blew up on the beach. L/Cpl. Harorld Winrow survived the initial assault and took part in the famous assault march to relieve the Airborne forces at the bridges over the Orne River and Caen Canal some 6 miles inland. In July 1944 L/Cpl. Harold Winrow was shot by a German Sniper but after just a few weeks recuperation he returned to the unit and as immediately transferred to serve as one of General Montgomery's special Commando Bodyguard as ordered by Winston Churchill. He served with the Commando Bodyguard until No.6 Commando returned to the UK in September 1944 whereupon he began training for operations in the Far East. The German Ardennes counter-offensive halted training and the Commando returned to Europe once more with L/Cpl. Winrow joining them in February 1945 after recovering from surgery for Appendicitis for the unit's push into Holland and Germany. In early October 1945 Cpl. Harold Winrow was transferred to the 1st Battalion of the South Lancashire Regiment and served with them in Palestine.